Grow your own natural beauty garden and craft up homegrown plant-based skincare with this DIY gardening kit. 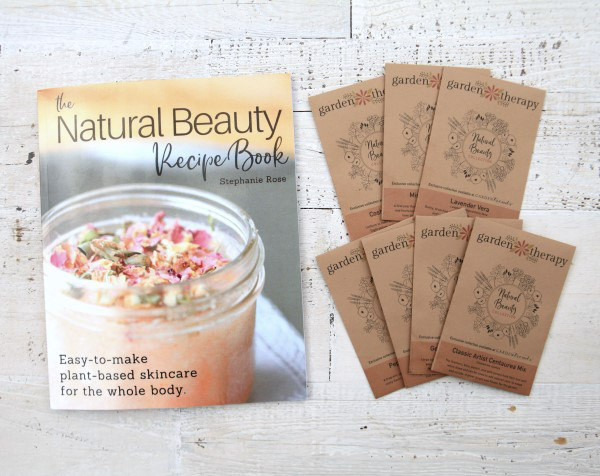 The collection comes with seven hand-selected seed varieties essential to a beauty garden, and The Natural Beauty Recipe Book (print edition) filled with over 30 recipes you can make easily at home. 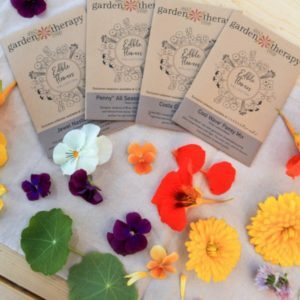 The seed collection includes 3 annual flowers (colorful Calendula and Cornflower [also known as Bachelor Buttons or Centaurea] mixes as well as charming, double-petaled Sunflowers) and 4 perennial herbs (2 different types of Lavender [Mini Blue and Vera], Lemon Balm, and Peppermint Mentha). 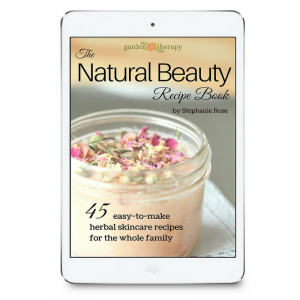 This unique combination of flowers and herbs will provide you some of the key plant-based ingredients needed to make yourself easy-to-craft natural beauty solutions right from home. Each variety was selected for its remarkable healing abilities and variety of uses so you can grow a complete and instant Natural Beauty Garden. The botanicals included (cornflower, calendula, and sunflower) hold their color well when fresh or dried, which means they are perfect as natural color elements in beauty products and you can feel good that you are not using synthetic dyes. I also chose color mixes to provide a rainbow of colorful petals (yellow, gold, orange, blue, purple, and pink) giving you a lot of variety when crafting your recipes. 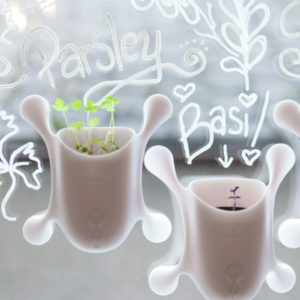 The herbs included pack a huge punch as they produce vigorously and are full of essential oils. You can grow these in a small container and still get a lot of leaves and flowers to use for your recipes. The herbs have a wide variety of healing properties for the skin such as calming, repairing, clarifying, and energizing. This gives you a lot of options to play around with and see what works best for you and your family. The herbs and flowers can all be grown together in one Natural Beauty Garden or grown throughout your existing garden spaces—this garden kit is designed to work with your space and needs, so you don’t need to worry about how to fit in a beauty garden. 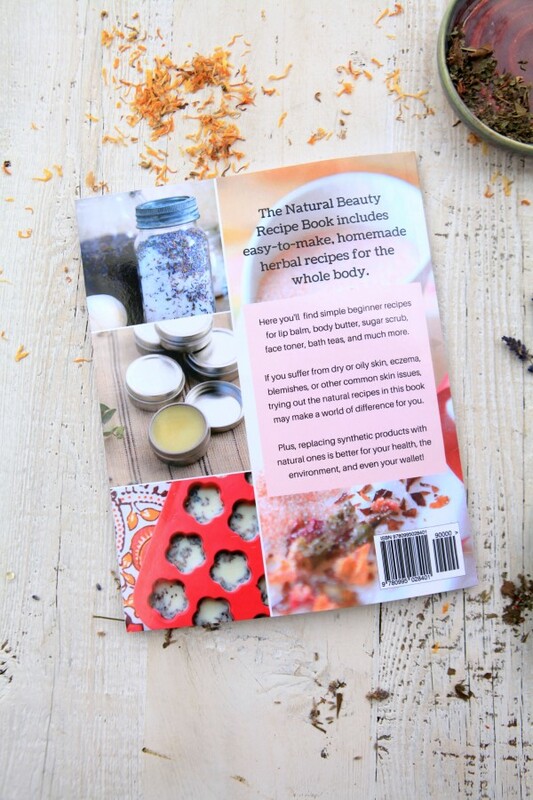 The Natural Beauty Recipe Book includes homemade herbal recipes for the whole body so you can replace your synthetic products from head to toe. 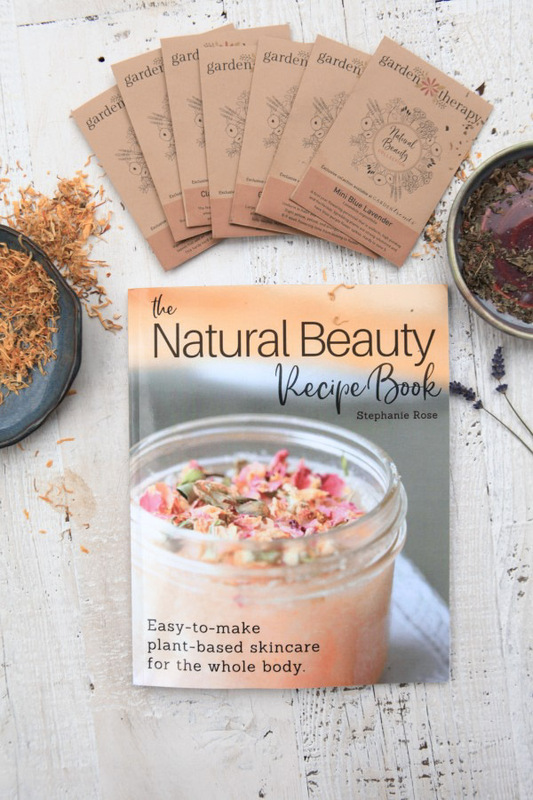 If you suffer from dry or oily skin, eczema, blemishes, or other common skin issues, trying out the natural recipes in this book may make a world of difference for you so you can feel better in your skin. Replacing synthetic products with natural ones is better for your health, environment, and even your wallet! Once you get the basic ingredients, you will quickly start saving a ton of money on buying more expensive synthetic products. If making your own skincare products sounds like a huge amount of work, think again! These recipes are so easy to make that anyone who can follow a soup or smoothie recipe can make them. This book uses ingredients that you may have in your kitchen and spice cupboard already. And the other ingredients are easy to find at a Whole Foods or Amazon so you will be able to stock up on supplies with ease. I include access to an online resource guide that I keep updated so you can always find the ingredients quickly. I made the recipes for this book in baking measurements like cups and tablespoons. This is unusual for natural beauty recipes, which are normally in weight measurements. I chose recipes that didn’t need precise measurements so you would have great success using no special equipment. If you have baking cups and spoons, you have everything you need to measure out the recipes. And let’s not forget that these recipes are gorgeous enough that you can give them away as gifts. I know that once you start making them you’ll enjoy it so much that you will want to make extras for friends and family. 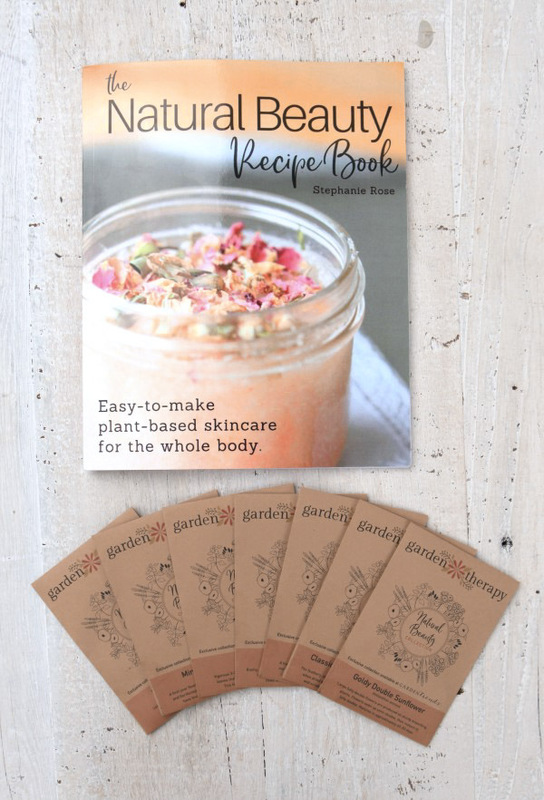 You can even use the recipes to start your own handcrafted beauty business. Many people who have purchased the book have gone on to sell their creations on Etsy, for fundraising, and at craft shows to make some extra money. 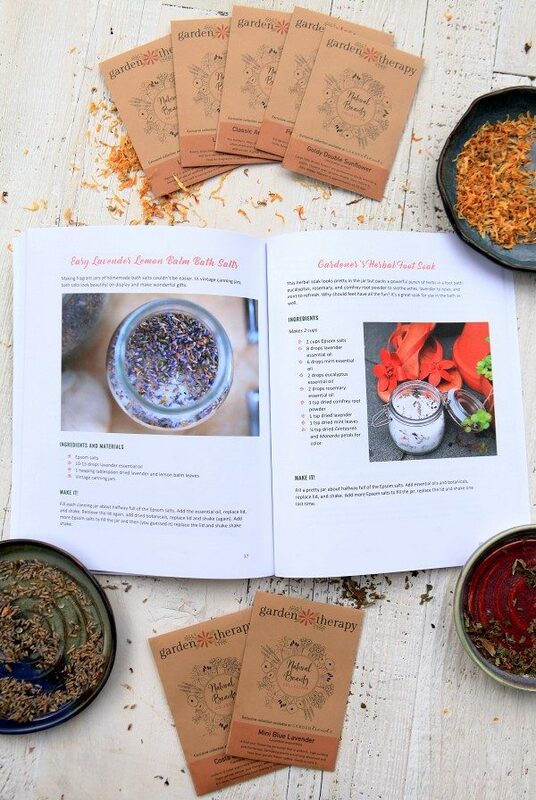 This book begins with a chapter outlining the different ingredients that you’ll need in your home supply: oils, butters, waxes, essential oils, botanicals, and more. 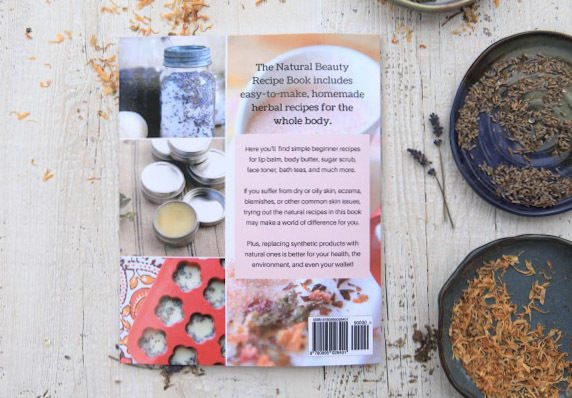 The rest of the book is broken into chapters of simple beginner recipes for natural beauty so you can choose what you want to start with. Scrubs, Lotions, & Potions covers exfoliating sugar and salt scrubs for your whole body, as well as homemade lotion, toner, face masks, and even a portable hand sanitizer. Balms and Butters covers the basics of making balms like lip balm, cuticle repair balm, and solid perfume, as well as body butter and even an all-natural vapor rub recipe for cold-and-flu season. Summer skin needs a little bit of extra love and you’ll find it in the chapter on Summer Skin Care. From sunscreen lip balm and sunburn lotion to bug sprays and insect bite relief, this chapter pampers your skin in every way under the sun.See a copy of the seed-starting and culture guide.